This solid oak bench was installed in Leigh Woods, near Bristol, in October 2009. It is situated on Stokeleigh Camp (an Iron Age hill fort) and was commissioned by the National Trust to commemorate 100 years since the land was donated to them. The research and construction of this bench is still one of my favourite commissions. It's great to see that it is weathering well and looking more and more 'of the place'.The paler bit about halfway along the top of the backrest seems to be where someone has recently sanded the wood (perhaps to try and remove some scratched-in graffiti?) That said, the graffiti is happily neither widespread nor deep on the bench so far. 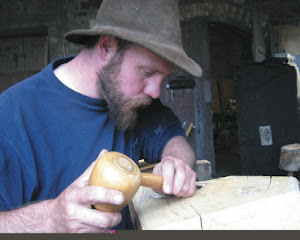 Oak heartwood is tough stuff! I 've just completed an interesting commission for someone studying for a product design degree at the University of the West of England. The client provided me with full-sized foam models of a pair of walking poles which had to be reproduced as exactly as possible in wood. I chose sweet chestnut wood and carved the poles with a knife, as it allowed the closest reproduction of the complex three dimensional forms of the models. It was a very interesting challenge (and hard physical work!) but both the client and I are very happy with the result. This is a short film about Boiling Wells in St Werburghs, Bristol where I work part-time. I hope you enjoy it! I went over to Westonbirt Arboretum in Gloucestershire today, to have a look at this exhibition that has one of my sculptures in it. Westonbirt is the national arboretum and has one of the finest tree collections in the country. The exhibition itself was really well curated by Sue Darlison and the other work on show was top quality. It's quite an honour to get to show with well-known names on the woodworking circuit, such as David Colwell of Trannon furniture design. Here's a picture of my piece in the hall. It was a great time to go, as a lot of the blossom was out, as were many wild flowers. Particularly beautiful were the wood anemones and wild primroses in the oak woods of Silk Wood, together with the first of the bluebells. Also in flower were camellias, rhododendrons and magnolias-making a great display. ...as well as azaleas, camellias and magnolias. 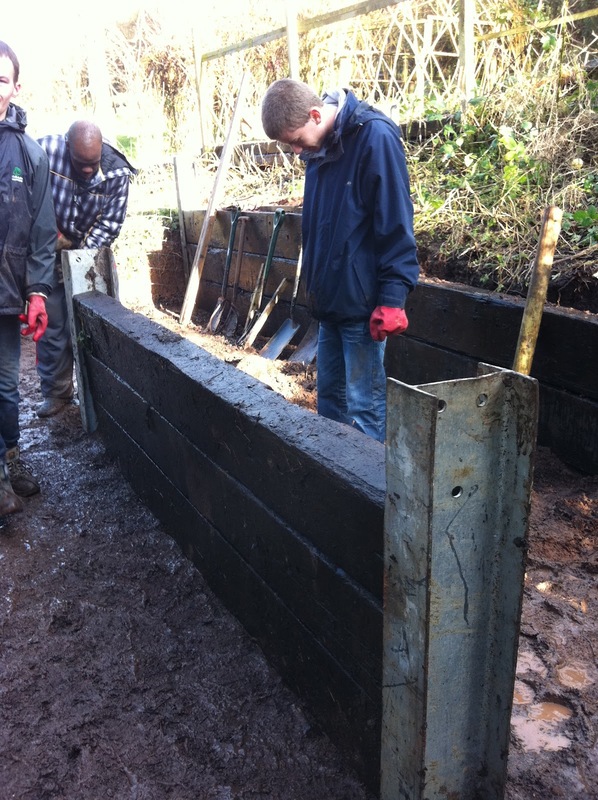 We have just finished working with a group supported by the organisation 'Young Bristol' at Boiling Wells. Everyone had a great time working together, clearing brambles and making different things. 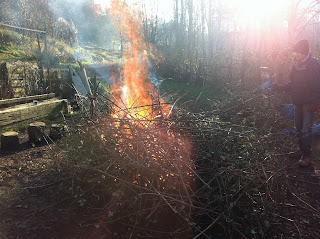 Everyone enjoyed the big bonfires with cleared brambles! Some days were very sunny and warm. We are making some steps up a bank here.